Samuel James MacFarlane was the youngest son of James and Sarah McFarlane. 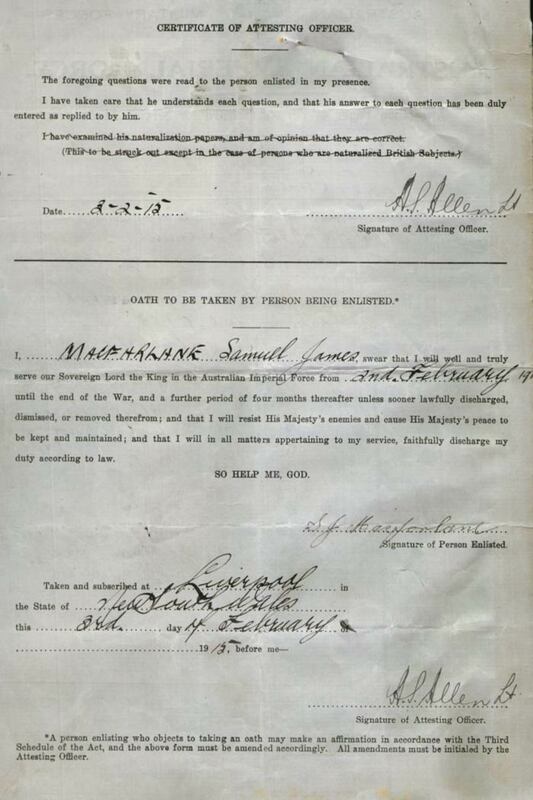 James McFarlane and Sarah Dickson were married on 24th March 1885 in the district of Cookstown. 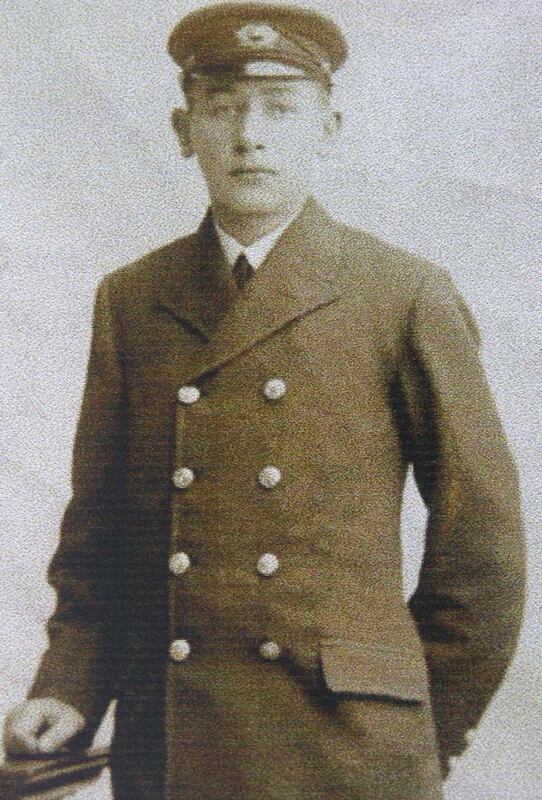 Samuel MacFarlane was born at Doons, Orritor, Cookstown on 17th March 1894. He was the youngest of six children, five surviving. Family: James MacFarlane, Sarah MacFarlane, Andrew Dickson MacFarlane (born 3rd February 1886), Letitia Jane MacFarlane (born 13th June 1887), Charles John MacFarlane (born 4th October 1888), Margaretta Sinclair MacFarlane (born 16th December 1889), Sarah MacFarlane (born 22nd June 1892, died 21st June 1893, age 1), Samuel James MacFarlane (born 17th March 1894). 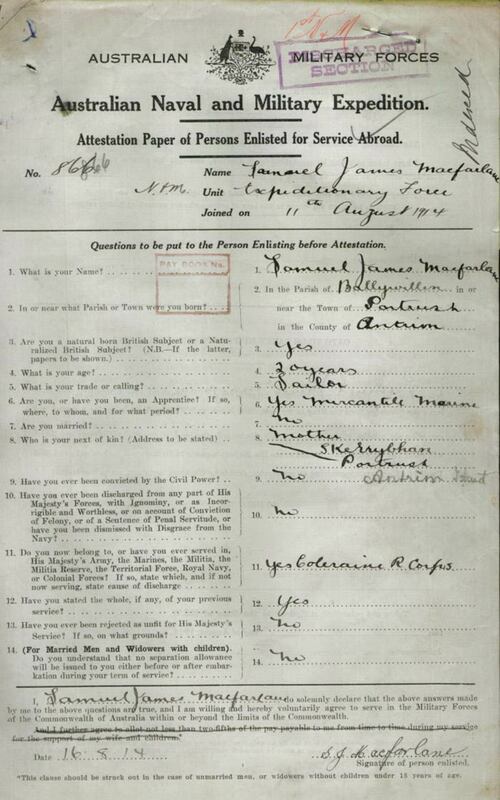 The 1901 census lists Samuel as 7 years old living with the family at house 4 in Doons, Orritor, Cookstown. His father was a farmer and mill owner. Samuel received his education at the Royal Academical Institution, Belfast and then at Coleraine Academy. The 1911 census does not list Samuel as living with the family at house 3 in Lansdowne Crescent, Portrush Town, County Antrim. All members of the family were described as hotel owners. 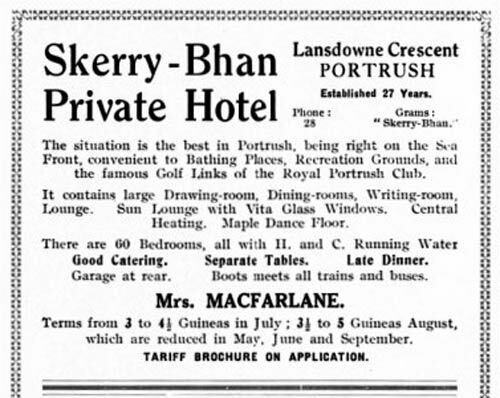 The family owned the Skerry Bhan Hotel in Portrush. On leaving school he served his apprenticeship as a mid-shipman with the Henderson Line of Steamers, trading between Glasgow and Rangoon. Samuel was a lifelong abstainer and an ardent unionist. 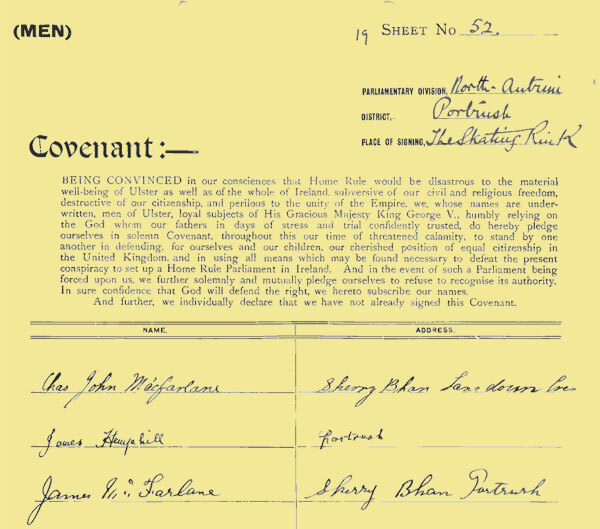 In 1912 he signed the Ulster Covenant in Portrush along with this brother Charles John. 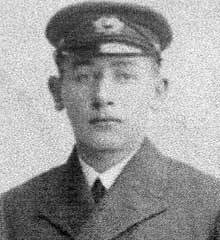 On a visit home in 1913 he assisted in the training of the Signalling Corps of the Ulster Volunteers at Portrush. 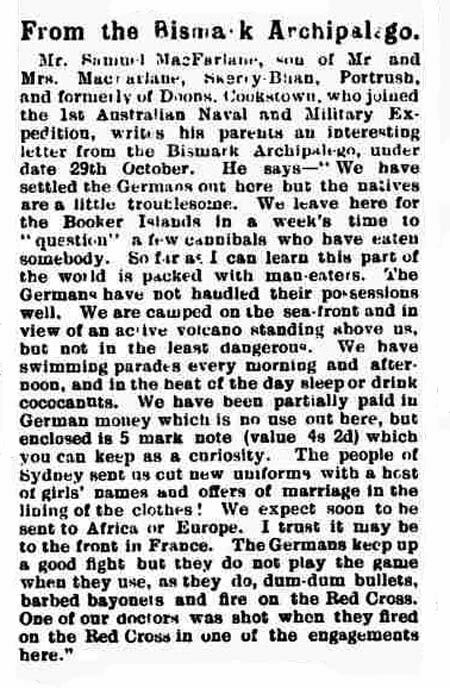 Samuel MacFarlane initially enlisted in Sydney on the outbreak of war on 16th August 1914. He gave his next of kin as his mother, and her address as Skerry Bhan, Portrush. 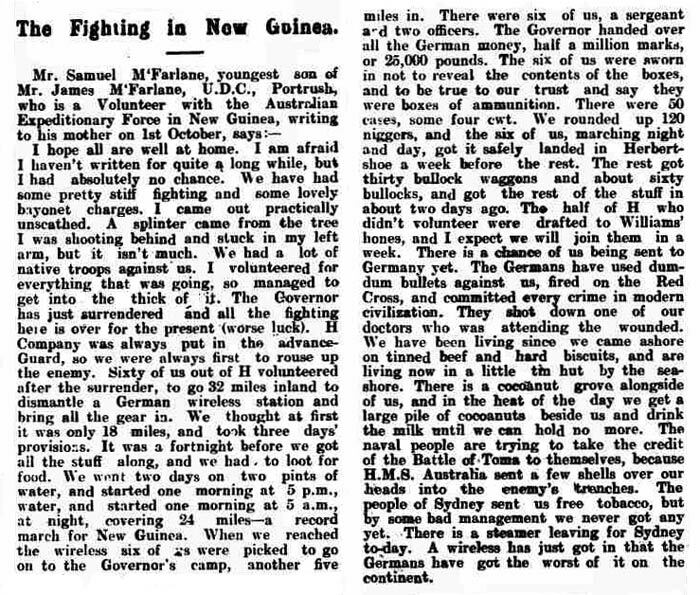 Private MacFarlane took part in the New Guinea Campaign. In a letter home he described the events of what is now known as the Siege of Toma. The events took place on the Papua New Guinea island of New England. Herbertshoe is located near Rabaul, on the north eastern tip New England. 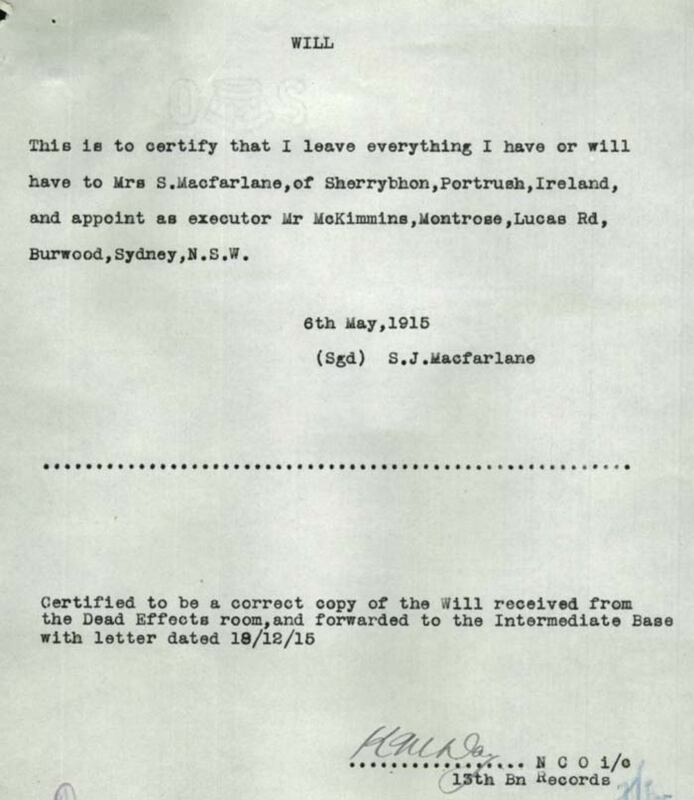 Samuel MacFarlane re-enlisted on the 2nd February 1915 in Liverpool, New South Wales. 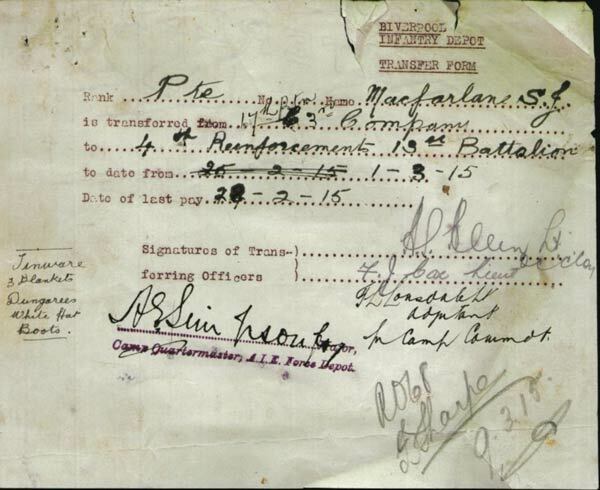 Private MacFarlane was at first posted to Cairo and then Gallipoli. 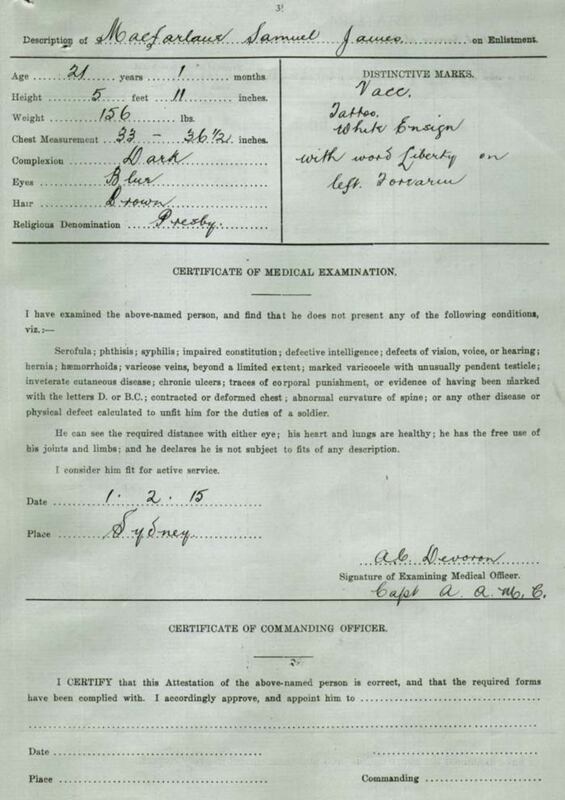 Private Samuel James MacFarlane was wounded at Gallipoli on 15th August 1915. He received a gunshot wound to the head. 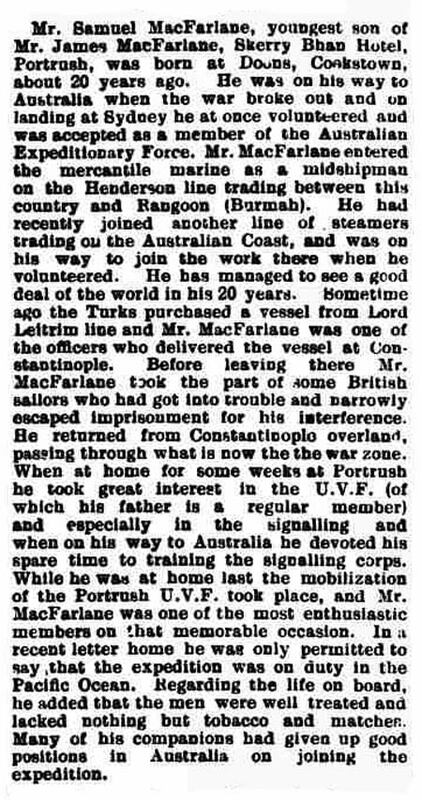 Private MacFarlane was evacuated to the Australian Hospital Ship ‘Valdivia’. 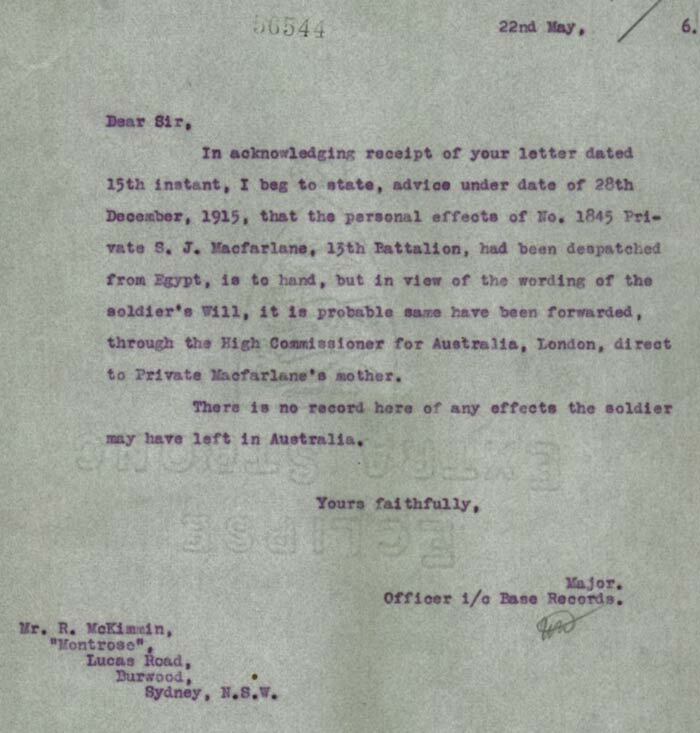 Private Samuel James MacFarlane was serving with the 13th Battalion of the Australian Infantry when he died of his wounds on the ship on 20th August 1915. 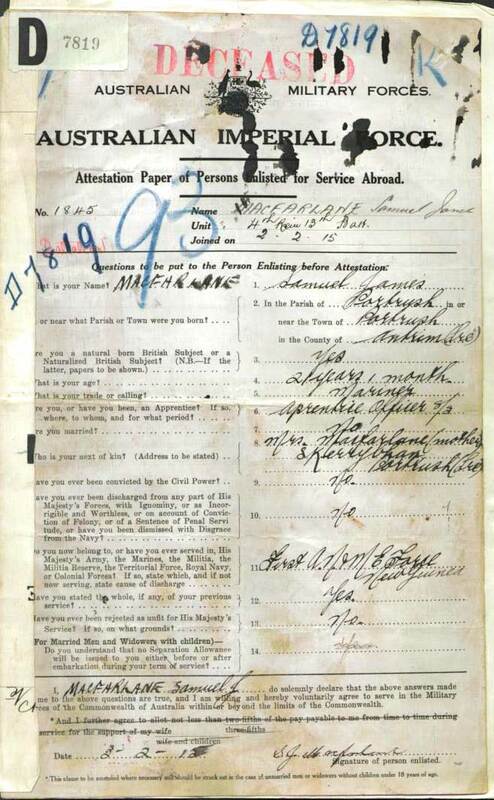 Private MacFarlane was buried at sea later that day. 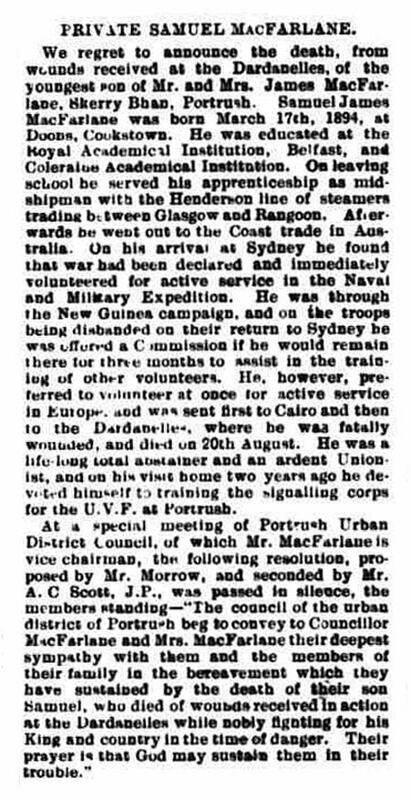 MACFARLANE – died of wounds received at Dardanelles. Samuel J, youngest son of James and Sarah MacFarlane, of Skerry Bhan, Portrush, age 21 years. In his Will, Samuel left all to his mother. 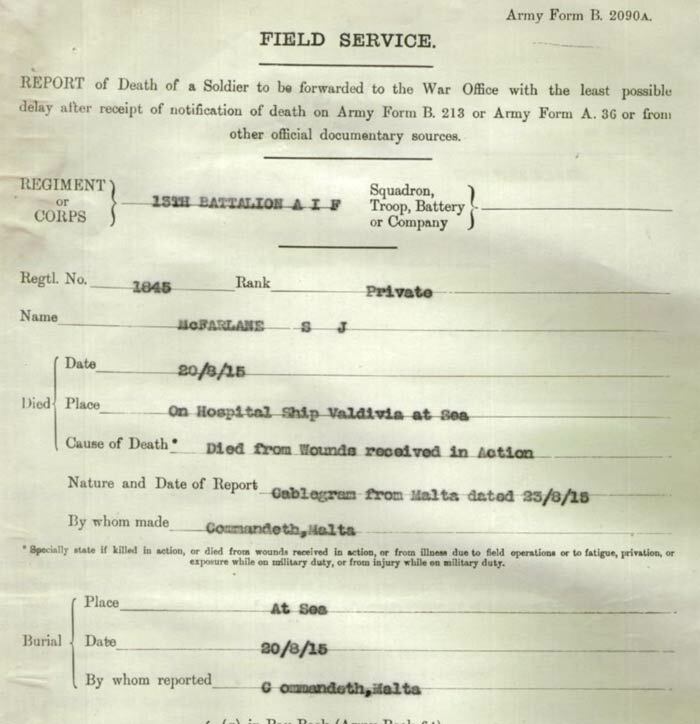 Private Samuel James MacFarlane is reported to have been recommended for a medal, although no record of this can be found. 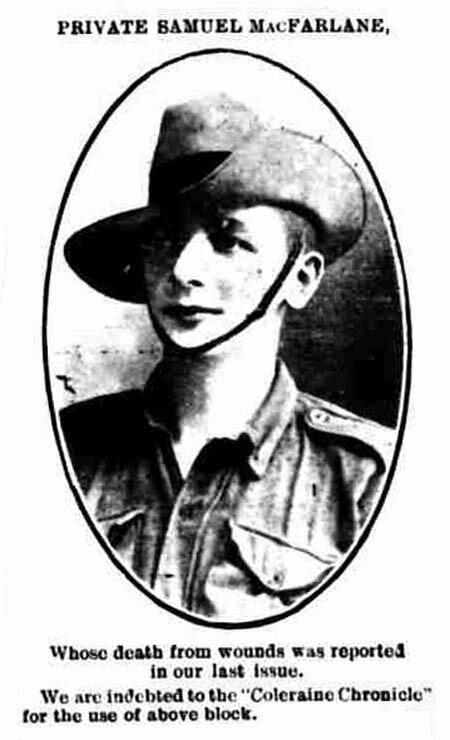 Private Samuel James MacFarlane is commemorated on Lone Pine Memorial at Gallipoli in Turkey. This inscription photo was taken by the Friends of the Somme Mid Ulster Branch on a visit to Gallipoli in September 2014. 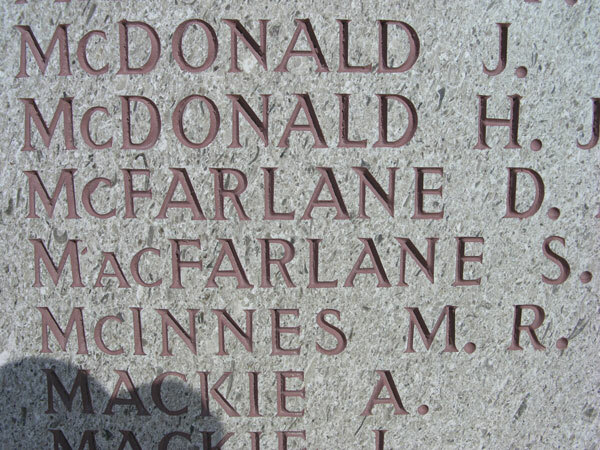 Private Samuel MacFarlane is also commemorated locally on Portrush War Memorial. Private Samuel MacFarlane is also commemorated in Portrush Presbyterian Church. 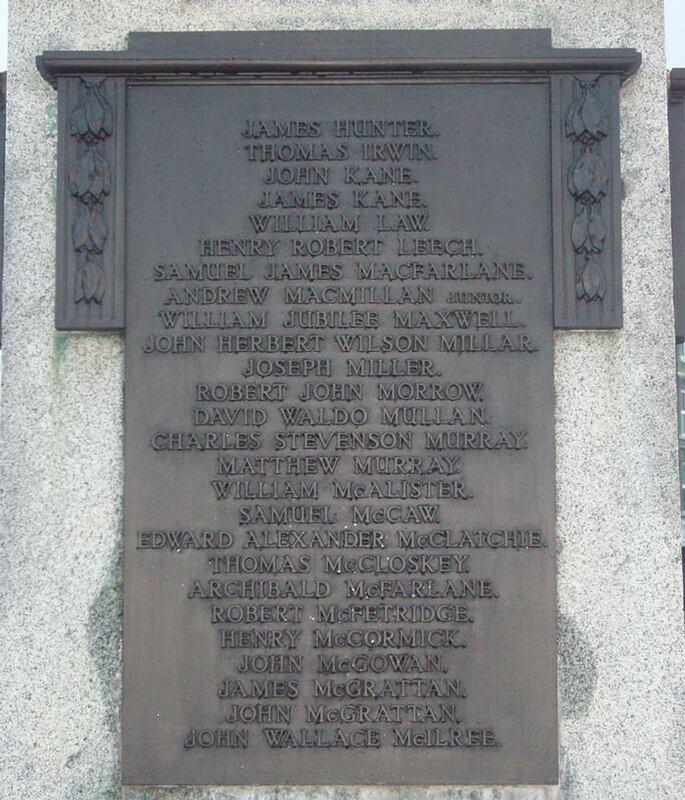 The book ‘Portrush Heroes 1914-18’ lists Samuel on pages 19 and 20. 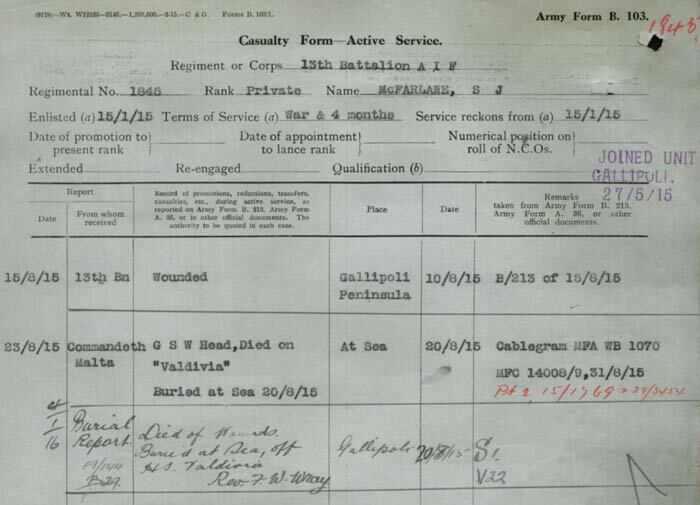 The CWGC record Private Samuel James MacFarlane as the son of James and Sarah MacFarlane of Skerry-Bhan, Portrush, Ireland.